The United States Supreme Court has weighed in on two K9 cases to conclude that a sniff is a search that must be supported by probable cause, and the reliability of that search is judged under the totality of the circumstances by examining the dog’s training and performance in controlled certification and training settings. In Florida v. Jardines, Miami/Dade County Detective Pedraja received an unverified tip that Jardines was growing marijuana in his house. A month later, the DEA and local police staked out Jardines’ home. They saw no activity and could not see past the closed blinds into Jardines’ house. After fifteen minutes, Pedraja and K9 Detective Bartelt walked Franky, a chocolate lab, up Jardines’ sidewalk. At the porch, Franky started to show changes in his behavior that indicated he sensed the odor of one of the controlled substances he had been trained to detect. Franky “bracketed,” sniffing back and forth to locate the source of that odor, and narrowed the source to the base of Jardines’ closed front door. Franky then “alerted” that he located the source of the odor by sitting at the front door. Pedraja used Franky’s performance to obtain a search warrant, and the subsequent search revealed marijuana plants in Jardines’ house. Jardines was arrested, and he challenged the warrant, claiming that the officers’ actions and Franky’s sniffing was a search unsupported by probable cause. As I suspected, the Court agreed with Jardines, relying on the concept of curtilage, the private area surrounding a person’s house. Traditionally, curtilage is part of the home itself, and enjoys the same constitutional protections as the inside of our homes. The police cannot not enter and search in one’s curtilage unless implicitly or explicitly invited. We explicitly invite our friends to dinner, and we implicitly invite trick-or-treaters and Girl Scouts selling cookies to walk up to our front door and to knock. Justice Scalia concluded that this implicit invitation could include an officer who walks up to the front door, unarmed with a trained K9, but does not extend to an officer with his highly trained K9 who is hoping to find incriminating evidence. Justice Scalia ended his analysis there, refusing to analyze whether the officers’ actions invaded Jardines’ right of privacy. Justice Alito, with Chief Justice Roberts, Justice Kennedy and Justice Breyer dissented, finding no trespass or invasion of privacy when the detectives spent all of one or two minutes walking down Jardines’ driveway to his front door. They also pointed to the fact that Detective Pedraja could smell marijuana from outside the door, although Detective Bartelt could not. In yet another Florida case, Florida v. Harris, Officer Wheetly pulled Harris over for a routine traffic stop. Harris was visibly nervous and had an open beer can in his truck. Wheetly decided to search Harris’s truck with his K9, Aldo. Aldo alerted at the driver side handle of Harris’s truck, and Wheetly found pseudoephedrine, matches, hydrochloric acid, iodine crystals and antifreeze – ingredients commonly used to make meth. However, Aldo was not trained to detect these ingredients – he had only been trained to detect meth, marijuana, cocaine, heroin and ecstacy. While Harris was on bond, Wheetly caught Harris with a broken tail light and pulled him over again. Aldo once again alerted at Harris’s driver side door, but Wheetly found nothing in the truck that time. Harris moved to suppress the meth ingredients. At the hearing on the motion to suppress, Wheetly testified to his and Aldo’s training. Wheetly and another dog had completed a 160-hour narcotics detection course. Aldo and a different handler completed a similar 120-hour course, and Aldo received a one-year certification from a private company. When Wheetly and Aldo teamed up, they completed a 40-hour refresher course together. Wheetly and Aldo train together four hours a week, with Wheetly hiding drugs in certain areas and leaving other areas blank to determine whether Waldo Alerted correctly. Monthly detection training logs showed that Aldo always found the hidden drugs and that he performed satisfactorily on each day of training. Harris didn’t challenge Aldo’s training, instead focusing on certification and field performance, including what he characterized as the two “false positive” results when Wheetly pulled him over. The trial court denied the motion. The Florida Supreme Court sided with Harris, spelling out an array of evidence, including field results and “false positive” records, that K9 officers must keep to establish probable cause. The United States Supreme Court handily sided with Aldo, ruling unanimously that K9 officers had no duty to maintain field performance history and records of purported “false positives.” The Court refused to adopt Florida’s laundry list of records that K9 officers had to maintain, going back to a “totality of the circumstances” test to conclude that probable cause is present if the dog’s training and testing in controlled settings support the dog’s reliability, and a defendant fails to undermine that evidence. The Court refused to hold a K9 to his field performance results. Those records would not show false negatives – when the K9 failed to find drugs that were present – because the officer would not have conducted the search and found the substance. More importantly here, if the dog alerts and the officer does not find drugs, that does not automatically result in a “false positive.” The Court had no problem concluding that Aldo was absolutely right when he alerted, but that the residual meth odor was in a quantity too small for Wheetly to observe and seize. The Court pointed out that defendants will have the opportunity through facts and expert testimony to challenge the reliability of detection dogs – and their handlers. Some of the challenges may include the adequacy of training and certification, the dog’s and handler’s performance in assessments, and even field performance. The Court gave two examples of field performance issues, including whether the handler intentionally or inadvertently cued the dog, or whether the dog and handler team were working in an unfamiliar environment. Ultimately, the Court phrased the question as “whether all the facts surrounding a dog’s alert, viewed through the lens of common sense, would make a reasonably prudent person think that a search would reveal contraband or evidence of a crime. A sniff is up to snuff when it meets that test.” In applying that test, the Court found that Aldo’s sniff was more than up to snuff. A recent study funded by the Department of Justice found that detection dogs in controlled environments were accurate 90% of the time, if not more. Interestingly enough, the dogs were rotated through three different diets, and a high fat diet increased accuracy. The study may be more anecdotal than scientific, with only 17 dogs and an eighteen-month window. But there is no doubt that our companions’ noses are super machines. It is no wonder that the first chapter of Alexandra Horowitz’s wonderful book, Inside of a Dog, begins with describing the world “from the dog’s point of nose.” In the chapter entitled “Sniff,” Horowitz describes beagles’ sense of smell as possibly “millions of times more sensitive than ours.” We routinely discourage our companions from using their noses when we are out on walks or when they greet our human friends in particularly exuberant doggy ways. 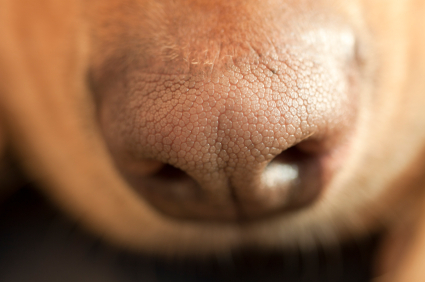 What can happen when we give our dogs a channel to use their “super sensitive instruments”? Apparently, great things! The April 2013 edition of The Whole Dog Journal describes how the new activity and sport, K9 Nose Work®, is helping shelter dogs cope and get adopted. 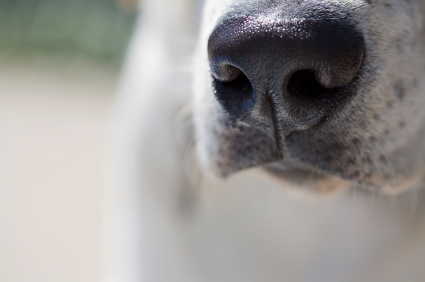 Doing K9 Nose Work® with my own dogs, Boomer and Sophie, and teaching K9 Nose Work® classes, give me a profound respect for our companions’ olfactory abilities. Categories: Animal Behaviorists and Trainers, Pet Owners, Pounds, Animal Control Officers and Law Enforcement, Rescues and Shelters | Tags: criminal law, Fourth Amendment, K-9, search and rescue, search and seizure | Permalink. In November 2006, an anonymous tipster informed police that Joelis Jardines might be growing marijuana at his house just south of Miami. Miami-Dade police and DEA agents began a surveillance operation outside the house. After a month of gathering intelligence on Jardines, police were ready to move in. Officer Bartlet showed up with Franky, a gregarious chocolate lab with a well-trained nose. Franky sniffed at the base of the front door, and quickly sat, alerting the officers to the presence of drugs. The police used Franky’s training and actions to request a search warrant, and detailed Franky’s impressive law enforcement history. Franky has participated in 656 narcotics detection tasks, with 399 positive alerts that have led officers to 13,008 grams of cocaine, 2,638 grams of heroin, 180 grams of methamphetamine, and 936,614 grams of both processed and live-growing marijuana. Armed with this information, officers succeeded in obtaining a search warrant for Jardines’ house. While executing the search warrant, police arrested Jardines as he tried to flee from the house. During the search, the officers confiscated 179 marijuana plants with a street value of over $700,000. Jardines was charged with drug trafficking and grand larceny for stealing electricity to grow the plants. Jardines pleaded not guilty, and challenged the warrant and the search. The trial court agreed with Jardines, tossing the evidence seized in the search. Florida’s intermediate appeals court disagreed, finding the search constitutional. The Florida Supreme Court sided with the trial court and ruled for Jardines. Now Florida prosecutors are pursuing the case to the United States Supreme Court. This would not be the first K-9 case in the United States Supreme Court. But if the Supreme Court takes this case, the Justices can examine the difference between “open fields,” which are fair game for a search, and “curtilage,” the area surrounding a house that is still constitutionally protected. Also up for discussion is whether the “plain view” doctrine – allowing officers to search and seize anything they can see in the open from a lawful vantage point – should be expanded to include the “plain sniff” doctrine. The Justices would also have to grapple with a case called Kyllo, relied on by the Florida Supreme Court to side with Jardines. Kyllo held that use of a thermal imager constituted an unlawful search because it revealed “intimate details,” namely the ambient temperature, inside a house. The Justices could easily decide that using Franky is not the same as using sense-enhancing technology such as a thermal imager, and that unlike the thermal imager that can relate to both lawful and unlawful activity, Franky is specifically trained to detect and alert to only unlawful substances. To follow whether the Supreme Court takes this case, and to find a link to the Florida Supreme Court’s opinion, visit SCOTUSblog. For more information and pictures of Franky in action, take a look at this AP article by Curt Anderson. Categories: Animal Behaviorists and Trainers, Pounds, Animal Control Officers and Law Enforcement | Tags: criminal law, Fourth Amendment, K-9, search and seizure | Permalink.